John, played by Adam Brown, lived his entire life in a bunker after a nuclear attack in Britain. He tries his best to continue living his dull life until one day the bunker systems start to fail and he is forced to go into the other sections of the bunker where he has not been there for a long time. In addition, he began to search his only friends he had ever: wooden toy dolls. In this guide we will show you where you can find them. 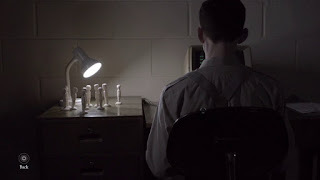 In The Bunker, there are numerous collectibles such as computers, documents and also 9 toys representing his friends. This relationship with them also explains the title of achievement "Friends", which you get when you have collected all dolls. - Follow the gameplay and look around everywhere, click everything and after a short time you will get the doll automatically. - In the episode Radiation you have the option to go through the door either with the porthole, or walk down the aisle. First explore the transition, because there you will find the toy Nurse at the door. - Once you have arrived on the 2nd floor, you turn on the light. - Wait until the subsequent sequence. - Then you walk across the room, the door on the other side. - Go through it and in the next room just to the right you’ll find the next doll. - In this room you go through the door on the right. - You enter the classroom. The doll you’ll find in the middle row of seats. - In the classroom you take the second door from the right. - You arrive in the Commissioner's Room, there you’ll encounter another sequence. - Look to the right on the ground and go in search of the toy. - After you reach at Level 3 you have to turn on the light. - Search this space. It is located right next to the table. - Once you have arrived on the 4th floor, you should look to the left. - In the small room you will find a desk with a computer on it. - Here, you walk right down stairs. - This is followed by a movie. After that you have to search for a door with a porthole. - Step into it to start another sequence. - Following you walk through the red-illuminated door on the left side to find the next toy. - In area where you have found the last toy, you see a trapdoor. - Take it to go to the next room. - To the left of the screen door where the last toy is hidden.